Sharing medical records using Patient Access is an easy way for you to quickly and securely give access to your temporary medical record. The shared record will be available for 24 hours via a unique link and secured using an access code. Patients can select the areas of their medical record which they want to share and have the option to stop sharing access at any point. Note: Sharing and/or exporting your medical record is only available to you if we have enabled you to view your medical record. We only offer this to patients that have explicitly requested this functionality and your record has been checked by a doctor to approve the request. Keep family and friends informed. Share medication and allergy histories with a nursing home. Get the most efficient care in an emergency. Take a look at this video demonstrating the benefits of sharing your record. Sign in to Patient Access in the usual way. 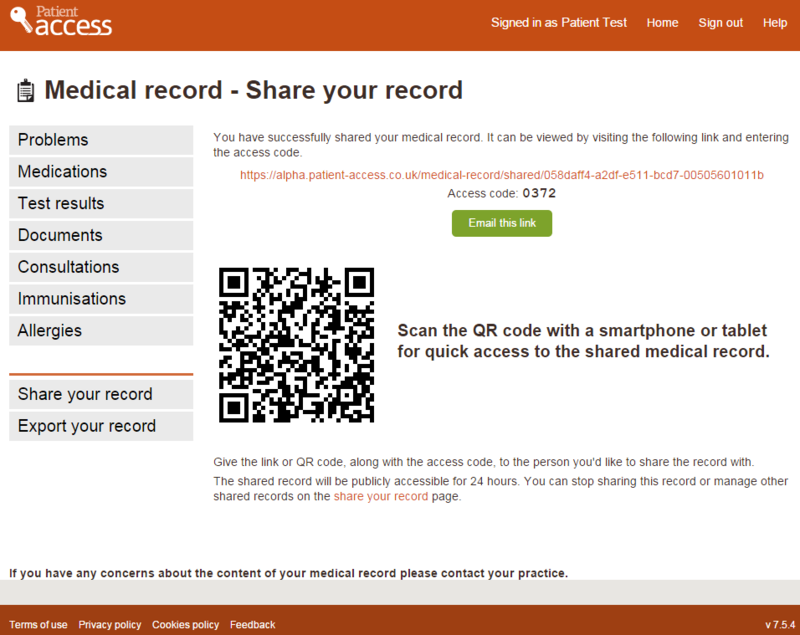 In the Medical record section of the Welcome page, click Share, to display the Medical record – Share your record screen. 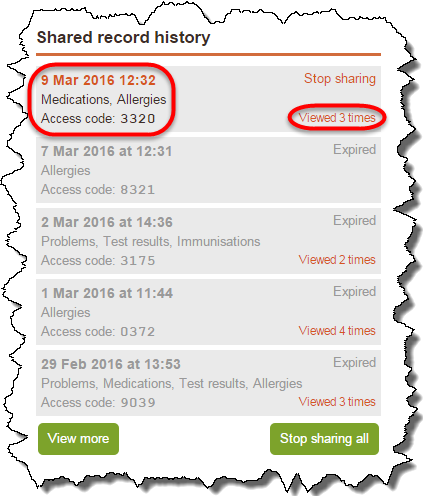 Tip: You can also share your record from the View medical record screen. Select the areas of the medical record you want to share. Note: You can only share areas of your medical record that we have configured you to view. Select I accept the terms and conditions, and then click Share record. 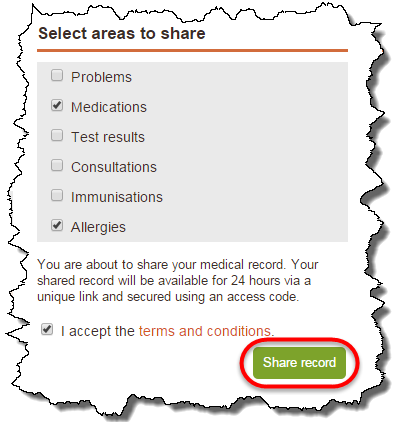 When you click Share record a message is displayed advising that you have successfully shared your medical record. It also includes a link to the shared record, an access code and an option to email the link, or scan the QR code with a smartphone or tablet for quick access. Note: The access code is required if accessing via the link or scanning the QR code. You can share the link with as many people as you want, the shared record history shows the date it was created, the areas shared, the access code and the number of times a link has been viewed. Tip: To view the audit, click the number of viewed times, this will display the time it was viewed and an IP address. You can share your record multiple times with different areas of your record shared. For example, you may only want to share the items of medication you are currently prescribed with to a family member, but you may want to share more information with a healthcare professional. The Shared record history will display the areas of the record shared in accordance with each individual shared record you created. You can stop sharing one instance of your shared record by clicking Stop sharing on the individual shared record. If you click Stop sharing all this will stop access to all the shared records you currently have active. Note: A warning message is displayed asking you to confirm that you want to stop sharing the shared record. When the person you’ve shared your record with uses the link, or scans the QR code, they will be prompted to type the access code. They can view the shared record for 10 minutes before being required to re-enter the access code. Note: It is your choice how you communicate the access code to the person you want to view your shared record. 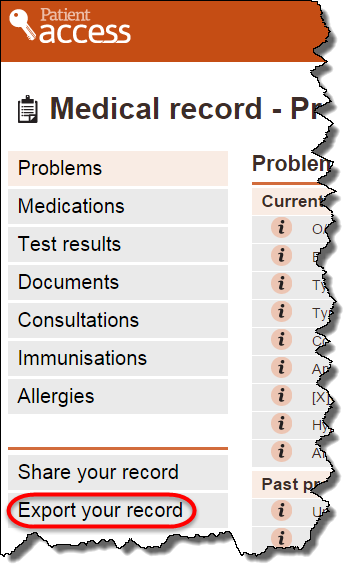 In the Medical record screen, click Export your record. Tip: You can also export your record from the Share your record screen. Warning: When you click export your record the following warning message is displayed:Exported files will contain sensitive information from your medical record. It is your responsibility to ensure that any files you download are stored securely and protected from unauthorized access. By exporting and downloading files from Patient Access, you agree to the terms and conditions. 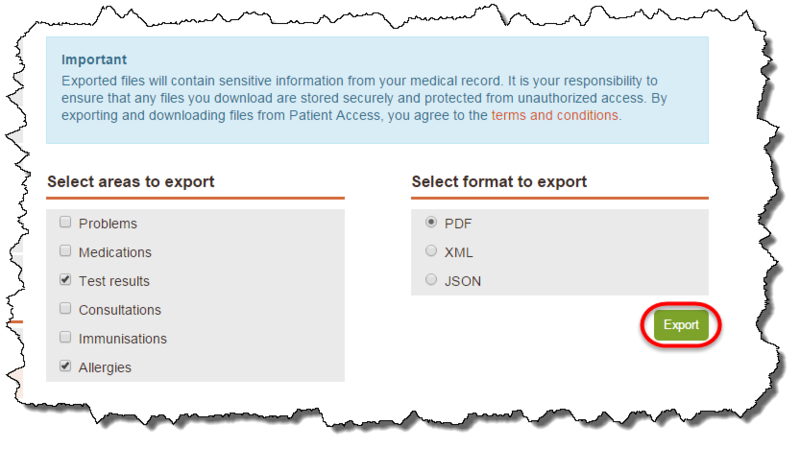 Select the areas of the medical record you want to export. Tip: You can only export areas of your medical record that your organisation has allowed you to view. Select the export format, and click Export. Tip: We advise you to use the PDF format to export your record.